On a mid-afternoon in April 2012, a number of us tourists visiting North Korea took a break from our traditional “palace” lunch. Huddled together in a dimly-lit restaurant in the city of Kaesong, we looked at our tour guide’s laptop in anticipation, then astonishment, as post-production clips from the first-ever Western and North Korean film collaboration brightly lit up the screen. Just six months later, “Comrade Kim Goes Flying” premiered at the Pyongyang International Film Festival and has since captured the hearts of viewers around the world. Before it screened at the Melbourne International Film Festival, co-director and producer Nicholas Bonner (the tour guide referred to earlier) told the audience that it was groundbreaking for this feature film to screen in Australia at the same time that it was making the rounds at North Korean co-operative farms. With that in mind, he also cautioned that the intended target audience was not us, and that certain elements in the film that may seem common or even outdated in movies today would be deemed innovative to our movie-watching counterparts in North Korea. That, “Comrade Kim Goes Flying” certainly is, with countenances of political leaders subtly reduced to likenesses in citizens’ obligatory brooches and revolutionary slogans serving as mere backdrops in scenes. Instead, the focus is on the heroine of “Comrade Kim Goes Flying”: Kim Yong Mi, a plucky daughter of a coal miner who could either follow her father’s footsteps or head to the capital of Pyongyang to pursue construction work for living. Secretly, though, Yong Mi really wants to be an acrobat. More specifically, a trapeze artist with the Pyongyang Circus, a job encouraged by her mother and grandmother, but not her more traditional father. 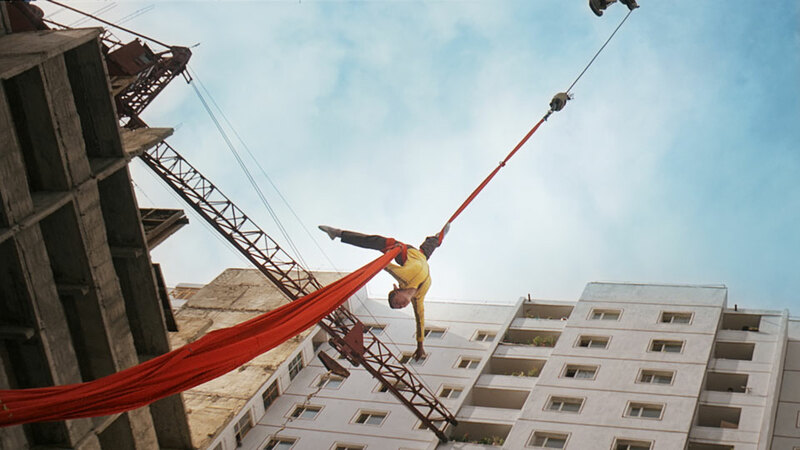 Through persistently cheeky determination, Yong Mi lies, cheats and sweet talks her way into pursuing her dream, although her path to transform from a working class country girl is anything but smooth, particularly when a rival male trapeze artist, Pak Jang Phil, does not think that she has the chops to fly through the air. Co-director and producer Nicholas Bonner talks about working on the first-ever film collaboration between North Korea and the West.